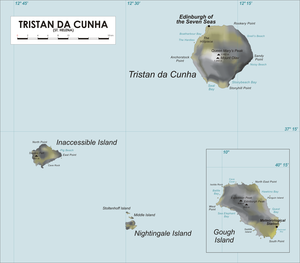 Map of Tristan da Cunha showing the Nightingale Islands and Inaccessible Island. The Nightingale Islands are a group of three islands in the South Atlantic Ocean, part of the Tristan da Cunha territory. They consist of Nightingale Island, Middle Island and Stoltenhoff Island. The islands are administered by the United Kingdom as part of the overseas territory of Saint Helena, Ascension and Tristan da Cunha. The Nightingale Islands are uninhabited. Nightingale Island is the smallest of the four main islands of the Tristan da Cunha Group, measuring only 4 square kilometres (1.5 sq mi), and lies 30 kilometres (18.6 mi) away from Tristan and 22 kilometres (13.7 mi) from Inaccessible. Stoltenhoff and Alex (also known as Middle Island), are really two large islets rather than conventional islands. −3,410 uncalibrated years BP by radiocarbon dates on peat overlain by volcanic tuff. Originally named "Gebrooken (Broken) island" by the Dutch under Jan Jacobszoon in January 1656, they found no safe anchorage and did not make the first landing until 1696 (most likely by Willem de Vlamingh in August of that year). Frenchman D'Etchevery also visited the island in September 1767. Nightingale was renamed after British captain Gamaliel Nightingale in 1760. Jonathan Lambert temporarily changed the name to "Lovel Island" in his 1811 proclamation in the Boston Gazette but as with his other proposed changes (i.e. Tristan da Cunha Group to "Isles of Refreshment") the name did not last. Nightingale, a tiny island, is home to more than three million pairs of seabirds at a density of around 1.3 pairs per square meter; almost the entire vegetated island is occupied. The Wilkins's Buntings are found nowhere else in the world. The Nightingale Islands group has been recognised internationally as part of the Tristan da Cunha Endemic Bird Area (EBA). It has also been identified as an Important Bird Area (IBA) by BirdLife International as a breeding site for seabirds and its endemic landbirds. Birds for which the IBA is significant include northern rockhopper penguins (up to 125,000 breeding pairs), sooty albatrosses (up to 250 pairs), Atlantic yellow-nosed albatrosses (5000 pairs), broad-billed prions (10,000 pairs), soft-plumaged petrels (up to 1000 pairs), great shearwaters (up to 3 million pairs), white-faced storm petrels (10,000 pairs), white-bellied storm petrels (1000 pairs), Antarctic terns (up to 400 pairs), southern skuas (up to 500 pairs), Tristan thrushes, Wilkins's buntings and Nightingale buntings. The nearby islands of a Gough and Inaccessible Island have been recognised as Wetlands of International Importance under the Ramsar Convention. The islanders of Tristan da Cunha depend on the fish resource to a large extent for food and for bait for the local rock lobster industry. Approximately 61.5 tons of linefish are harvested each year for these purposes. The insular nature of the island ecosystem renders it vulnerable to over-exploitation from commercial fishing operations. Most of the fish species are bound to the islands for the completion of their life cycles; hence, the populations are more or less isolated and not supplemented by recruits from outside of the system. ^ "Nightingale Island group". Important Bird Areas factsheet. BirdLife International. 2012. Archived from the original on July 10, 2007. Retrieved 2012-10-26. ^ "The Annotated Ramsar List: United Kingdom". Ramsar.org. Archived from the original on 9 April 2013. Retrieved 6 April 2013. ^ Andrew, T.G. ; Hecht, T.; Heemstra, Phillip C.; Lutjeharms, J.R.E. (1995). "Fishes of the Tristan da Cunha Group and Gough Island, South Atlantic Ocean". Ichthyological Bulletin J.L.B. Smith Institute of Ichthyology. J.L.B. Smith Institute of Ichthyology, Rhodes University, Grahamstown, South Africa (63). Retrieved 20 September 2015.